Paint | AMMO AUTO CARE INC.
What is the best technique to touch up rock chips? 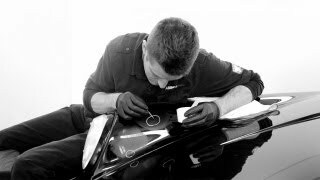 Rock chips are simply part of vehicle ownership, especially if you DRIVE IT! Watch the video below for a few tips on how to repair the damage. Remember, touch up’s primary purpose is to PROTECT the existing paint from allowing oxidation to creep under the paint through the hole (ie…the chip) in your paint. The second purpose is to make the paint “look better”. This process takes lots and lots of patience. If you are looking for perfection, then you will need to get the area repainted. What is AMMO Hydrate and how does it work? AMMO Hydrate is designed to lubricate the paint during the drying process to help minimize swirls and scratches while removing water from the surface of your paint. It also offers a layer of protection to the paint with incredible shine. What is the most common cause of hazy/swirled paint? ANYTIME THE PAINT IS TOUCHED, WIPED, WASHED, COVERED, CLEANED, BRUSHED, OR DUSTED… IT IS SURELY GETTING SCRATCHED. 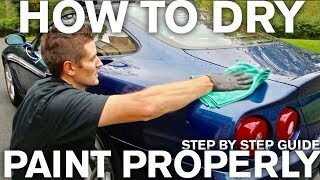 Keep this mind anytime you touch your paint with anything (MF towel, your finger, wash mitt, etc…) Do it properly or don’t do it at all, otherwise you will pay the price later by having to polish or compound to remove your love marks. Wax (commonly referred to as Brazilian carnauba wax) is an organic based product produced naturally in certain regions of Brazil. The tree produces wax to protect itself from the intense sun found near the equator. This wax is cultivated and mixed with various solvents and other waxes to create what we find in our “wax jars”. (This is a very simplified version of the process and chemistry required to produce a final product, but for the purposes of this FAQ remember “carnuaba wax” is ORGANIC. In the most optimal conditions, organic wax will last 40-60 days on a vehicle). “Sealant” is also a very broad term that is sometimes used or interchanged with Teflon, Polymer, Resins, etc… All of which are simply marketing term to portray a level of protection that is usually not possible. Having said this, sealants typically offer more protection than waxes because they are produced in a laboratory with those particular characteristics in mind. Unlike waxes, which can be limited by their organic nature, sealants can offer protection of 4-5 months in the optimal conditions.